The initial chaos and confusion surrounding the rollout is a harbinger of the damage to come from alienating Muslims worldwide, empowering radicals, and abandoning refugees to suffer in camps. Far from making us safer, the executive order is widely viewed as a direct threat to our national security and an assault on American values. Of all the controversial provisions of the order, none is more problematic and damaging than the religious test that gives priority to refugees fleeing religious persecution if, and only if, they are a religious minority in their country of origin. The intent is clear: Open the door to Christians from Muslim-majority countries while doing everything possible to keep Muslims out. Now, six months later, Trump’s Muslim ban under another guise is the official policy of the United States government. From a human rights perspective, the most disturbing parts of the executive order bar refugees for four months, cut the number allowed in by 60,000, impose a religious test, and freeze indefinitely the refugee resettlement of Syrians. Taken together, these policies add up to an inhumane, immoral and woefully inadequate response to the greatest humanitarian crisis since World War II. Contradictions and ironies abound. Trump recently told Christian Broadcast News that he wanted to help Syrian Christians, whom he claimed (without citing evidence) were deliberately kept out while Syrian Muslim refugees were let in under the last administration. But his executive order bars all refugees from Syria indefinitely — meaning that Christians facing genocide in Syria will have no haven in America. Last year the U.S. accepted a small number of Syrians (10,000 as of August 2016) out of the nearly 5 million Syrian refugees. After Trump’s order, the number will be zero. Once the four-month ban on refugees from other countries is lifted, the number of projected refugees will be cut almost in half and those seeking entry will face a religious test. Beyond humanitarian concerns, I am convinced that Trump’s order is also unconstitutional. 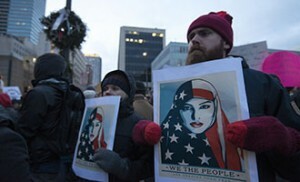 The Establishment clause of the First Amendment prohibits government from targeting Muslims for exclusion and favoring Christians for admission; in short, prioritizing some religious groups over others. Lawsuits have already been filed challenging Trump on First Amendment and other constitutional grounds. If strengthening national security is the goal, keeping out refugees — Muslim or otherwise — is not the solution. Refugees are currently vetted for over two years before being allowed entry, and no person accepted into the U.S. as a refugee has been implicated in a fatal terrorist attack since systematic procedures were established for accepting refugees in 1980, according to an analysis of terrorism immigration risks by the Cato Institute. Orwellian doublespeak cannot obscure the hostility toward Muslims and Islam that animates President Trump’s executive order on immigration. A Muslim ban is a Muslim ban by any other name. On the day we remember the Nazi genocide of the Jews, the United States closed the door to those fleeing genocide today. Charles C. Haynes is vice president of the Newseum Institute and founding director of the Religious Freedom Center. Contact him via email at chaynes@newseum.org. Follow him on Twitter at @hayneschaynes. This entry was posted in Inside the First Amendment, News and tagged First Amendment, Newseum Institute, Religion, Religion Commentary by Charles C. Haynes. Bookmark the permalink. The righteous outrage which you so articulately expressed demands that we all take unified action to defy this new order; this disgraceful, harmful, and soulless administration.